Another week has passed and again, not too many movies seen this week, but I was very impressed with two of the films I did see. Which ones, you may ask? Read on and find out (if you dare). Seriously, please read on. I'd been looking forward to seeing this one for a while - it was highly recommended at the AV Club in their Oscar line up. While this film didn't end up winning the Best Foreign Language Film, I can safely say it's way better than A Better World (despite having not seen the latter movie) . Actually, I should probably retract that last statement, at least until I've seen all the nominated films. I made a similar claim last year, when I felt A Prophet was robbed at the Academy Awards, but then saw The Secret In Their Eyes and realised that both films were equally brilliant. Anyway, Dogtooth definitely isn't going to be for everyone - it's probably the most twisted, incestuous story to come out of Greece since Oedipus. The storyline involves an extremely overprotective father who keeps his children (two girls and a boy, who all appear to be in their 20s) at home all day, preventing them from experiencing the outside world. As the film progresses, it becomes apparent that the kids have never been out of the house and though they are kept in good shape physically, their mental and emotional development has been warped. The father and mother have given their children the impression that the world outside their comfortable middle class home is a terrifying and deadly place, and exert almost complete control over their children's lives. The children are constantly playing games with each other, vying for top dog status in the household - and in playing those games we see their repressed sexuality and stunted social skills. The delicate balance of the family's home life is thrown into disorder by the arrival of a female security guard at the factory that the father owns, who is brought in on a regular basis to sexually service the son, but brings in evidence of a world outside the family home in the form of videotapes of Rocky and Jaws. Having seen the tapes, the oldest daughter begins to plot her escape, with horrifying and horrific results. Though the film is obviously very dark in nature, it also features flashes of black comedy (such as the way in which the parents deliberately misinform their children of the meanings of words which they come across - so, for example, the word 'zombie' is defined as a 'small yellow flower'). I was thoroughly engrossed and captivated by this film, and highly recommend it. On to another movie which I thoroughly enjoyed. In a way, I suspect this may be partly due to my fairly low expectations for this film before I went in. I'd seen a few lukewarm reviews for Hanna, so wasn't expecting too much, but came away rather dazzled. (Something similar happened recently with Limitless, which I had very low expectations for, based on its reviews, but really enjoyed). The movie can be seen either as a spy thriller, or as a modern day fairytale - a young girl (Hanna, played brilliantly by Saoirse Ronan) has grown up in the remote woods of northern Finland, where her father, a bearded woodsman has been training her in combat and survival skills. Having reached the age of 16, she decides she is ready for the outside world, but before she and her father can reenter society, they must first defeat a rogue CIA agent/ wicked witch played by Cate Blanchett. The cinematography for this movie is just gorgeous, with some beautifully shot scenes of arctic forests in Finland, and of the Moroccan desert. 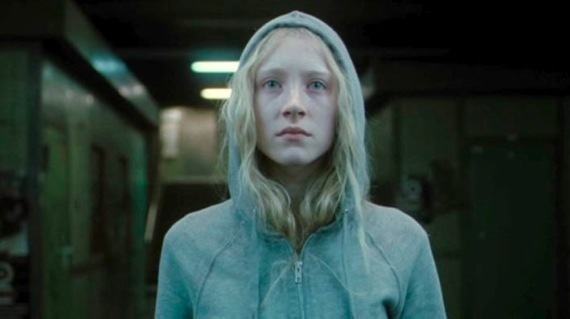 I was equally impressed with the soundtrack and sound mixing - the propulsive score by the Chemical Brothers heightens the tension during the fight scenes and really helps the viewer empathise with unease that Hanna feels as she experiences the outside world for the first time. The film has a few problems - there are a few dubious accents on display, the plotline doesn't provide answers to all the questions that it raises, and if I'm nitpicking, it seems a little odd that Hanna is able to take out a whole troup of highly trained American soldiers, but has real problems in tackling a camp German chap in a tracksuit and a couple of skinheads . Despite all that, I came away from the cinema with a big grin on my face and I'm more than willing to forgive a movie a few flaws in view of its many virtues. In which an exclusive golf club is faced with a number of threats to its snobby, privileged existence - a crass new arrival to the club is putting the members noses out of joint, and gophers are tearing apart the greens. Can Bill Murray's deranged greenskeeper resolve the gopher situation? Will Rodney Dangerfield's wisecracking noveau riche slob triumph over the blueblooded Judge Smails? Can caddy Danny Noonan claim a scholarship from the judge whilst romancing his niece? All these questions (and more!) are answered by watching this vintage comedy. I've heard quite a few people mention Caddyshack as an absolute, stone cold classic, so I was quite looking forward to watching it. 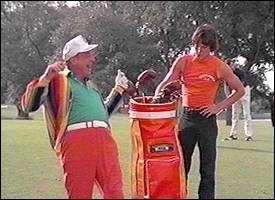 It doesn't quite match up to the hype (in my opinion), but there were still quite a few laughs throughout the movie - I really liked most of the scenes which feature Rodney Dangerfield, and Chevy Chase's zen golf routine was funny too. I suppose what I'll take from it most of all is an understanding of the Simpsons episode Burns Baby Burns - quite a few of Rodney Dangerfield's lines in that episode are pretty much lifted from this movie. Overall then, funny, but a bit patchy and rather dated.